(Newser) – Cars heading into Manhattan must have at least three people inside for the next few days, although vehicles on the George Washington Bridge are exempt. The rule, intended to cut down on post-Sandy gridlock, starts this evening and applies to the four bridges over the East River, the Henry Hudson Bridge, the Triboro Bridge, and the Lincoln Tunnel, reports the New York Post. It will be enforced through midnight Friday. Yesterday i was picked up by a "complete stranger" aka "Good Samaritan" and got to where i was going way faster than waiting for a packed city bus. In times like these communities need to not only come together, but adapt. If you're so afraid of "strangers" than maybe you don't deserve to live in this great City. Me, myself and I isn't going to get this city back on track. 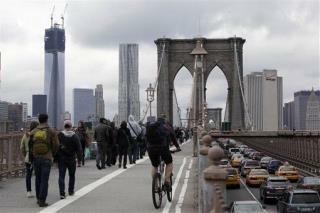 Mayor Bloombutt actually suggested picking up pedestrians standing by the bridge so you could cross into Manhattan? YEAH RIGHT!!!!! Like I'm going to stop and pick up a couple of complete strangers standing by a bridge in Broolkyn!!!!! If there is ever a time when Manhattan needs a congestion tax, that time is now. Especially since its going to take more money than exists to fix everything that is damaged. They are talking about replacing the entire track control system, token kiosks, turnstyle controllers, and everything else electrical in the subway due to salt water. The one thing they really need is a vault door system for all subway entrances. It could be operated by an electronic interlock. Once the platform is shut down and cleared, the doors are closed. This would cut down on the serious flooding. Air venting systems need to go about 20 feet above street level. As for London's congestion tax, its a sticker you display on your car like a pikepass. You keep it funded through online or kiosk payments. The White House currently owes hundreds of thousands of dollars in non-payment. The U.S.A. owes millions in unpaid London taxes.